FLAGSTAFF, Ariz. - A college student was released from the hospital Thursday after surviving what she said was a nine-day ordeal of being stuck in her car in the snow with no heavy coat, blankets or gloves and only two candy bars for food. Authorities are still not clear about why 23-year-old Lauren Weinberg drove to the desolate mountain area of Arizona during finals week at Arizona State University before she was rescued Wednesday. She was less than a mile from a ranch and in an area that had cell phone service. She told authorities her phone wasn't working, and her car could not be seen from the ranch, where workers plowed through 10 inches of snow to get her out. Authorities and the U.S. Forest Service workers who found Weinberg said they had no reason to doubt her story of survival amid 2 feet of snow and temperatures that plunged to near zero. One of the people who rescued her said he could see floor mats draped over Weinberg's legs while she sat in her car, which still had gas. "You can say survival skills or a miracle, either way," Phoenix police Officer James Holmes, whose agency was investigating her disappearance. "But the good thing is she's home and safe." 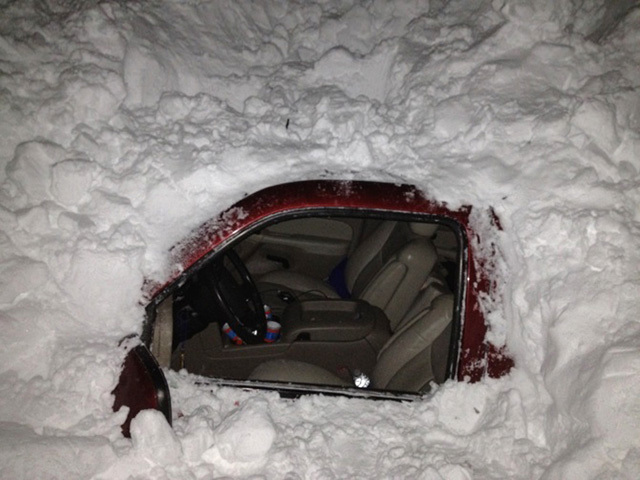 It was one of two snow rescues in the Southwest on Wednesday. A Texas family found themselves struggling to breathe after nearly two days in their SUV after it was buried under 4 feet of snow and ice on a rural New Mexico highway. Two Forest Service employees on snowmobiles found Weinberg about 45 miles southeast of Winslow while checking gates on forest roads. One of them had checked the same gate the morning of Dec. 12  the day Weinberg said she became stranded and a day after she was last seen at her mother's home in Phoenix  but didn't spot anything. Weinberg had the two candy bars with her and later told a deputy that she put snow in a water bottle and placed it atop the sedan to melt it for drinking water. She had been driving with no specific destination, traveling south from Winslow toward the Mogollon Rim  a prominent line of cliffs that divides the state's high country from the desert, Coconino County sheriff's spokesman Gerry Blair said. The area is frequented mostly by firewood gatherers, hunters and local ranchers. After the paved road turned into a dirt road, Weinberg stopped at a fence line to move a gate and her vehicle got stuck in the snow, Blair said. Forest Service worker Bob McDonald said he called out to see if anyone was around the vehicle, and Weinberg opened the back door, looking surprised and relieved. Gary Strickland, who was trailing McDonald on a second snowmobile, gave Weinberg his fleece jacket and she consumed a packaged lunch, bag of chips and water they had given her. Weinberg used Strickland's cell phone to call family, picking up on a signal from the cell phone tower on the private ranch about a half-mile up the road. "I could not even begin to predict how she could (survive), but I have no reason not to believe her story," said McDonald. "As a parent myself, missing a child for nine days and not knowing where they are, it was extremely fortunate." Other than being cold, hungry and thirsty, she was in good condition, lucid and speaking coherently, Blair said. Holmes said the family wants to enjoy Weinberg's return and was not immediately interested in speaking with reporters. Police said Weinberg missed her final exams while she was stranded. After she was reported missing, they managed to track her through purchases at convenience stores before the trail went cold. "I am so thankful to be alive and warm," Weinberg said in a statement late Wednesday. "Thank you everyone for your thoughts and prayers, because they worked. There were times I was afraid but mostly I had faith I would be found." One member of the Texas family found in New Mexico, Yvonne Higgins, remained hospitalized with pneumonia Thursday. Her husband, David Higgins, and his father were on their way to pick up the family's vehicle after it was pulled by rescuers from the snowdrift near Springer, N.M. The family plans to return to Texas when his wife is released from the hospital, though it was unclear when that might be. Rescuers had to dig through snow and ice to free the Higgins family, who left their home near League City, Texas, on Sunday for a ski trip in northern New Mexico. The couple and their 5-year-old daughter, Hannah, were clinging to each other and were lethargic early Wednesday. David Higgins was able to keep the car running for a couple of hours, but when he wanted to clear the exhaust pipe, his door was blocked. He tried to shove his arm through the top of the window, but it went about 16 inches and still was covered in snow. The family had plenty of water, sandwiches, chips and snack mix. But as the hours passed, it seemed as if they were working harder to breathe inside the buried SUV. "We weren't sure of it, but we think we were running out of air. That was spooky," the 48-year-old father told The Associated Press. He eventually reached his brother in Texas by cellphone and the distress call was relayed to state police, who launched a search Tuesday evening. Higgins had a simple message for travelers this winter: Throw a case of water and a sleeping bag in the car. "It will be there if you need it," he said.